While preferences and tastes of consumers differ, for any given good or service (x) each consumer is willing to pay a price to obtain a given quantity of the good. If the quantities each consumer is willing to buy at a given price are added horizontally the market demand curve for the commodity can be constructed (M&Y 10th Fig. 5.1; M&Y 11th Fig. 4.1; B&Z Fig. 4.6; B&Z not displayed; B&B not displayed). Thus while the demand curves for individual consumers will show different levels of purchases at different prices, at any given price one can sum up the amount all consumers are willing to buy. Hence, the industry or market demand curve is equal to the horizontal summation of the individual demand curves of each consumer. All things being equal, the higher the price of a good or services, the smaller the quantity demanded. This is the Law of Demand. Among other things the law reflects the substitution and income effect of a price increase on the quantity of a good demanded by consumers. i - Substitution Effect: when the price of a good increases it does so relative to all other goods. Although each good is unique it has substitutes - other goods that will serve almost as well. As the opportunity cost of a good rises, people will tend to buy less of it and more of its substitutes. ii - Income Effect: when the price of a good rises, all things being equal, it rises relative to income. Faced with a higher price and an unchanged income, the quantity of at least some goods and services must decrease. The demand curve (and schedule) shows the relationship between the price of a good or service and the quantity demanded. In effect the curve shows consumers' 'willingness to pay' and 'ability to pay' to obtain a given quantity of a good or service. All things being equal, the demand curve will be downward sloping reflecting the law of demand: the higher the price, the lower the demand; the lower the price, the greater the demand. Assuming other prices remain constant and other factors do not change, there will be movement along the demand curve as the price of the good or service changes. Price elasticity refers to the percentage change in the quantity of a commodity demanded compared to a percentage change in its price. 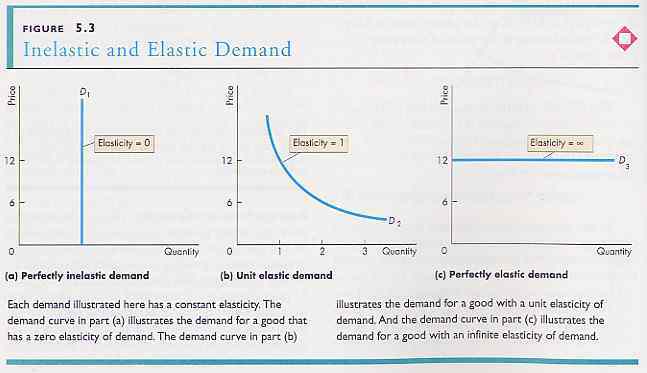 In the case of demand elasticity, an increase in price causes a decrease in quantity, that is the demand curve is negatively sloped. Accordingly, elasticity would be negative. However, elasticity is always reported in terms of its absolute value regardless of sign (except for inferior goods in calculating the cross elasticity of a complementary or substitute good - see below). Elasticity of substitution or cross-elasticity refers to the percentage change in the amount of a commodity (x) substituted for another by a consumer in response to a change in the price of a substitute (y).